First published twenty years ago, Wilderness & Travel Medicine has been a trusted staple of emergency first-aid packages sold worldwide by Adventure Medical Kits. Now, for the first time, this comprehensive reference is also available to anyone who ventures away from civilization. 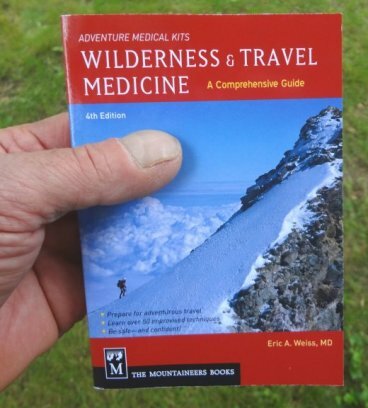 Completely revised and updated by Dr. Eric A. Weiss, a nationally recognized expert in wilderness medicine, the new 4th edition covers everything you need to know to stay safe in the outdoors. It includes topics to include: CPR, shock, fractures and sprains, head, eye, and dental injuries, poisonings, frostbite, hypothermia, cuts and burns, heat illnesses, gunshot wounds, altitude sickness, evacuations, parasites and travel diseases, and much more. Add on to all you First Aid kits! Measures a pocket-size 4-1/2" x 6" with 224 pages.